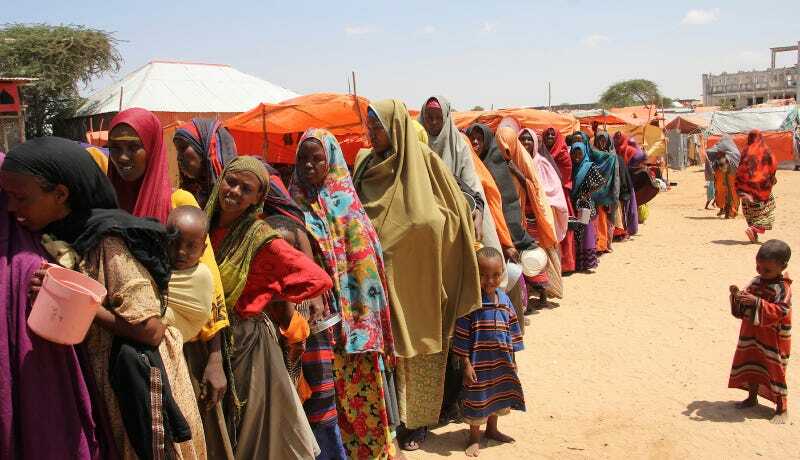 Displaced Somali women stand in line to receive food handouts on March 27, 2017. Image via AP Photo. Today, scientists published a study demonstrating how extreme weather events are made more likely by anthropogenic climate change. Tomorrow, following a humiliating health care defeat, Donald Trump will pivot to things he can do, such allowing his friends in the oil and gas industry to continue cooking the planet to death. The order will compel federal agencies to quickly identify any actions that could burden the production or use of domestic energy resources, including nuclear power, and then work to suspend, revise or rescind the policies unless they are legally mandated, are necessary for the public interest or promote development. It also will toss out two Obama-era directives that gave consideration of climate change a prominent role in federal rule making. One advised government agencies to factor climate change into environmental reviews, such as those governing where oil drilling should take place. The other, called the “social cost of carbon,” is a metric reflecting the potential economic damage from climate change that was used by the Obama administration to justify a suite of regulations. In addition, the order will require the Interior Department to allow the sale of new coal leases on federal land, and require the EPA to consider yanking or revising regulations meant to reduce greenhouse gas emissions from power plants. The order will also revoke Obama directives on reducing methane emissions, and the Trump administration is expected to ask the Supreme Court to put Clean Power Plan litigation on hold so they can have time to revise it or scrap it entirely. Somalia is currently facing its second famine in six years, brought on by drought and war; South Sudan, Nigeria, and Yemen are close behind, the New York Times reports; Burundi, Kenya, Rwanda, Uganda, Ethiopia and Tanzania are also facing food crises. Unlike the U.S., none of these countries have contributed substantially to the climate change that’s believed to have amplified this drought and cratered their food supply, and yet the Trump administration, washing their hands entirely of the concept of foreign aid, insists both on making a terrible problem worse and doing less to mitigate its impacts. You can’t really go lower than this.